The American Marketing Association (AMA) has engaged some of the world’s most innovative professionals, academics, and thought leaders to create The Seven Problems of Marketing—a seven-book series that introduces and explores a new set of organizing and actionable principles for the twenty-first-century marketer. 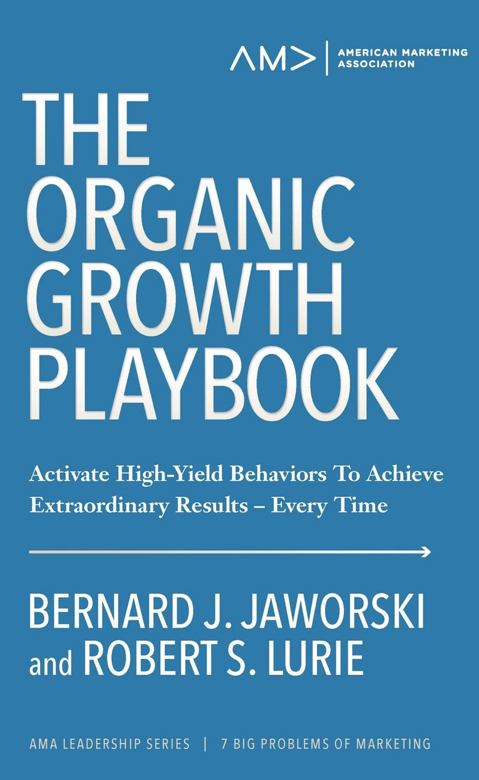 The first book in the series is The Organic Growth Playbook: Activate High-Yield Behaviors To Achieve Extraordinary Results—Every Time by Bernard Jaworski and Robert S. Lurie. We caught up with Bernie to find out how to effectively targeting high-value sources of growth. Bernie Jaworski is the Peter F. Drucker Chair in Management and the Liberal Arts, which is named in honor of Peter Drucker, the founder of modern management and the namesake of the Drucker School of Management at Claremont Graduate School. The professorship is awarded to an internationally recognized scholar who carries on the Drucker legacy of tempering sound business practices with a commitment to social responsibility. Thanks for joining us again, Bernie. Last time we talked about the biggest problems or challenges facing marketers. This time we’re going to chat about your new book, co-authored with Bob Lurie, on the challenge of “organic growth.” What message does the book give us? Our focus in this book is on helping you grow your company more rapidly and reliably—without resorting to acquisitions. Buying another company is, of course, a quick way to grow revenues. And it’s often a valuable way of acquiring skills, assets, and access needed for further growth. Growth through acquisition is certainly easier and quicker than growing by outcompeting rivals. Nonetheless, profitable, steady organic growth—be it by taking market share from competitors or by convincing existing customers to consume more of the product—is the acid test for companies and managers. No matter how skilled you are at dealing with the myriad functional challenges of running an organization, if you can’t find a way to increase sales from existing or newly developed products, your company will, sooner or later, cease to exist. It will be acquired, dismantled, or shut down. It’s that simple. The pervasiveness of the growth challenge is due to the fact that virtually all managers—not just CEOs—face difficult competitive conditions with an inadequate tool kit for growth. Nearly all markets today are characterized by multiple competitors with similar capabilities, talent, and products. Moreover, in all these markets, customers almost always know the product offerings. They’ve heard many messages about the products and are familiar with the performance of a good number of them. So most managers in most markets find themselves trying to grow a good (but not great) product. Their product is largely viewed by customers and potential customers as similar to all the others. They know their product has some strong selling points, perhaps an aspect of functionality or perhaps an element of service, in which they’re clearly better than competitors. They also know—though they’re often reluctant to admit it—that their product has some weak points relative to their competitors’ products. Most of all, they know that they’re competing in a roughly equal sports league. Everyone is playing the same game, with largely the same talent, product, and offering. It’s not easy to carve out a path to sustained growth and success in that kind of competitive environment. So that’s the challenge we set out to solve. The central idea of The Organic Growth Playbook is that faster sales growth results from designing offers and campaigns that have a relentless, integrated focus on changing one or two high-yield customer behaviors. This is in sharp contrast to the conventional growth approach, which focuses on differentiating product offerings from those of competitors. The core logic of the conventional approach is that if a brand is sufficiently different and better than competitors’ brands, consumers will come to prefer it and will actively seek it out for purchase. But it very often doesn’t work out that way. Every customer goes through some type of buying process before purchasing a product or a service. They may talk to friends who’ve already bought the product. They may visit stores and sample the product. They may look up information about the product or service on the internet. They may articulate and debate the pros and cons of the product. Sometimes their buying process is lengthy, involving multiple activities and iterations. Other times it’s short and simple. But, in every customer’s process there’s an action that decisively shapes which product or service they ultimately purchase. The Organic Growth Playbook is built around this important insight. It lays out an approach you can use to change the behavior of customers at critical places in their buying process, thereby shifting them onto paths that favor the purchase of your product or service instead of a competitor’s. When your team can impact what customers do during the key phases of the buying process, sales can grow much faster, and with less effort. It’s about changing customer behavior? The Playbook does follow the structure of the four-step conventional approach. It calls for segmenting your market, prioritizing and targeting just a few of those segments, developing a value proposition for each target segment, and designing offers and promotional activities around those value propositions. Where it differs is in the content of those steps, in how the market is segmented and value propositions developed. Its focus is on customer behaviors rather than product. When you segment, target, position, and promote around high-yield behaviors in the buyer’s decision-making process rather than focusing on product positioning, you can boost your growth rates by 1.5 to 2 times—and count on doing so reliably. But if you continue to center your growth planning on product positioning—as the classic approach dictates—you’ll continue to struggle or fail more often than not. Time and time again we saw smart, skilled, highly motivated business managers follow the classic approach only to see their growth plans fall short. Over time, we realized that the reason the classic approach failed to generate growth lay, ironically, in its most critical assumption: that once a product is favorably differentiated in a customer’s mind—once they’ve been convinced they like a certain product—they’re going to buy it. In reality, what we observed in market after market was that customers who said they understood and preferred one product’s positioning very often bought some other product. Why? Because something they did or saw or experienced during the buying process made the other, initially less well-positioned product a better choice in that situation. Literally, the influence of who they were with, where they could locate a product, or the order in which they looked at products on the internet, shifted their path through the buying process in a way that led them away from purchasing an initiallypreferred product toward a completely different product. The point? Even when customers find a product’s positioning clear, distinct, and desirable, they often don’t buy it. In effect, great product positioning is a necessary condition for growth, but it’s not sufficient in and of itself to drive growth. To drive sales growth reliably and rapidly, it’s essential to focus relentlessly on shaping the way the customer proceeds through the whole buying process—and not simply on its very last step. Without giving too much away, what else do you cover in the book? Thanks so much. I must add that this is a very practical book because of all the examples, insightful case studies and handy templates you’ve provided for the readers. That was part of the objective. We want to help our readers use this playbook, because it works.